Additional Info: WI-FI Available through Wifinity. A £50 deposit secures the booking, and the balance is due 8 weeks before holiday starts. Please include names & ages of all guests and pets for safety and security reasons , your address, telephone number , and dates you wish to book your holiday with us. Thank you. Welcome and see you soon. 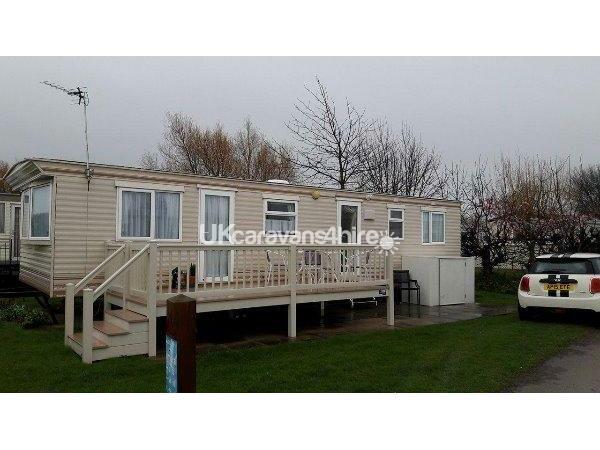 Welcome to the Balmoral area of Manor Park Holiday Village, Hunstanton, where her decking area is situated on a perfect pitch for the sun all day, and in those cooler months she has full central heating, double glazing and thermal curtains. 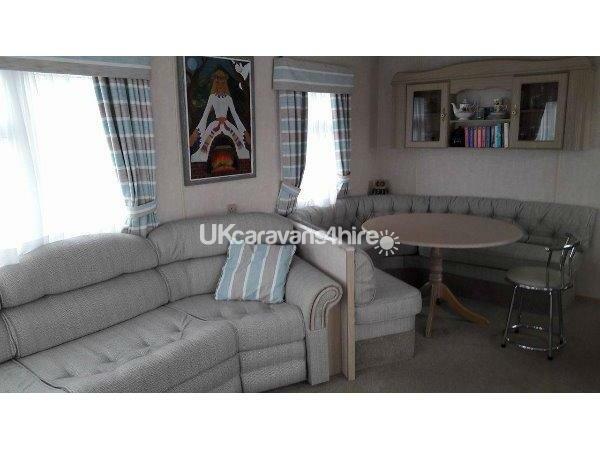 This caravan is a spacious and comfortable holiday home and has a large family lounge with pull out double and single sofa bed to accommodate one or two guests in the lounge, and she is 6 berth in total. There is room for a travel cot, and there are two large dog cushions with washable covers that may seat two small dogs or two large. 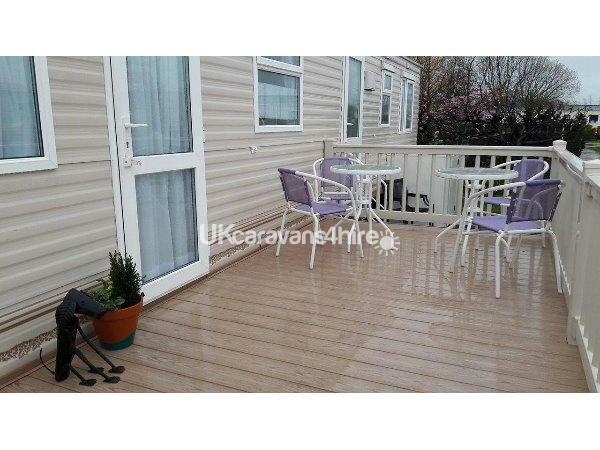 The caravan has a good sized decking area outside with a gate that locks being perfect for keeping children and dogs safe, and in a good position for the sun. I would suggest that one enters by the second separate hall door near the patio, hence keeping the decking area locked. There are two outdoor tables with chairs and lounger. There is a 29" television. 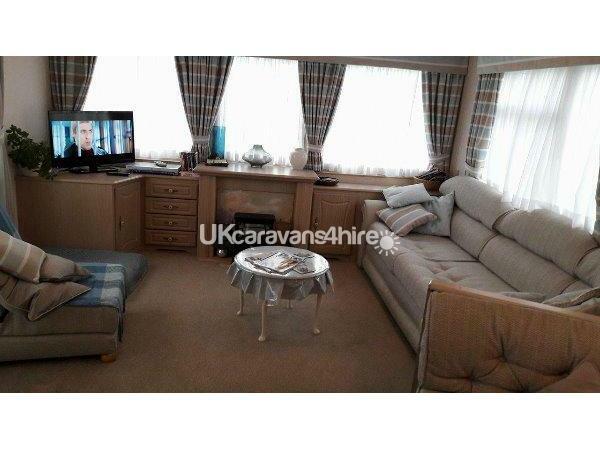 DVD player and electric fire in the lounge, and soft lighting for comfortable evenings staying in. The electric and gas that you use is included in the advertised prices. 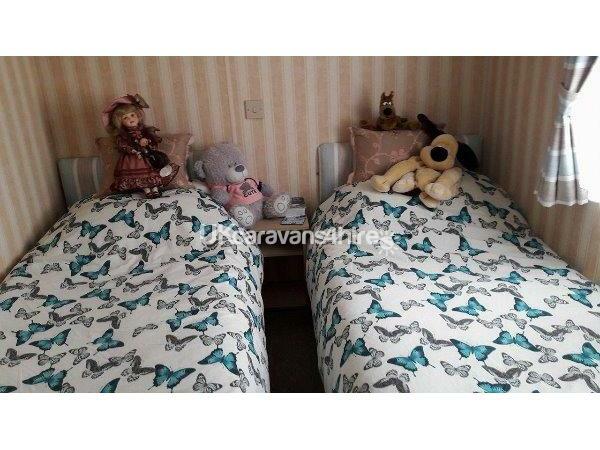 The main bedroom is a comfortable size and has a double bed, dressing table and a good sized double wardrobe. 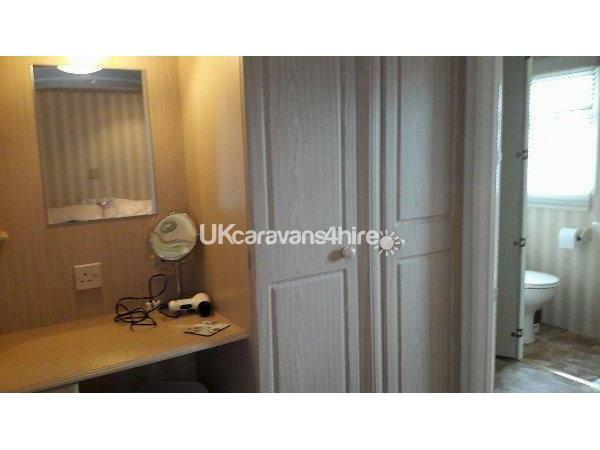 The twin bedroom has #two full size# single beds with a wardrobe and wall storage. 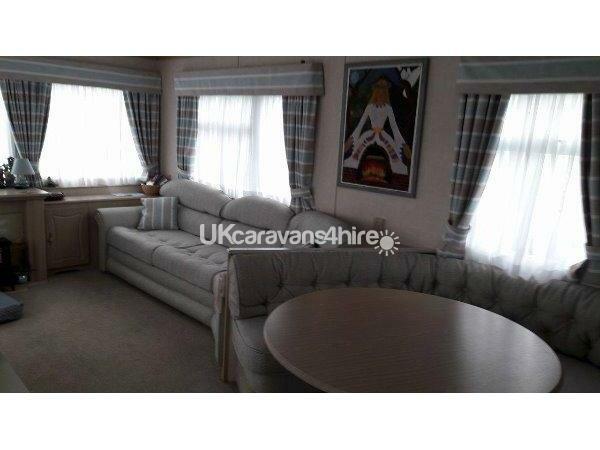 All windows to the caravan have custom made curtains that are blackout for relaxing mornings and thermal for winter evenings. Al windows have white voiles for your privacy. 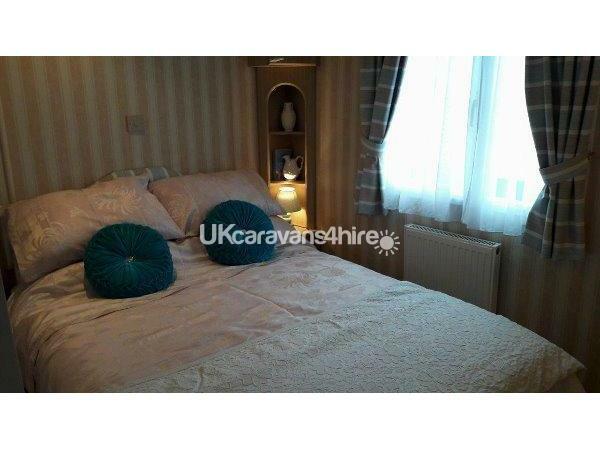 The kitchen area is open plan from the dining area and living room and is fully equipped with the crockery and utensils needed for your holiday. 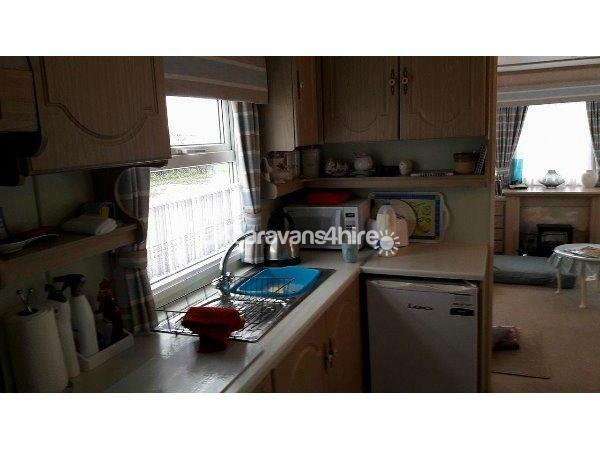 There is a microwave, gas hob and cooker, fridge with a freezer compartment inside, and all electrical appliances needed for your holiday. The local Tesco is a two minute drive to collect your groceries, or Sainsbury is in central town. Lidl is being built this year on the main road into Hunstanton. You will find fresh milk in the fridge, and coffee and tea on arrival for refreshment before or after unpacking. 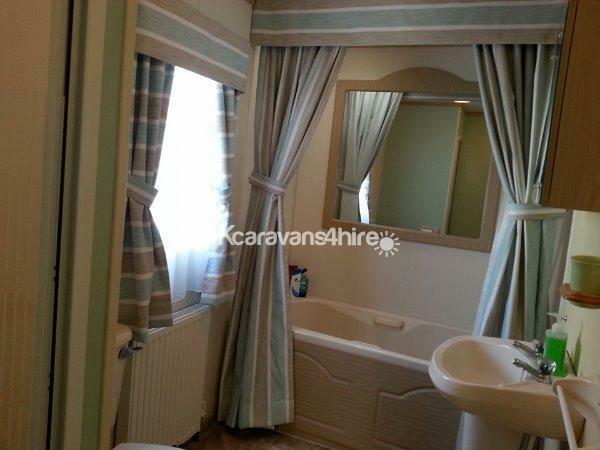 The unusual 'Very' large bathroom comprises of a toilet, a wash basin, a separate shower unit to one side and a full size bath with good grip handles to the other side. This is a convenient feature for a disabled person or elderly person, however there are steps to the exterior decking area that may have to be taken into consideration.There is also a separate small room with toilet and hand-basin for family convenience. I leave hand towels but you will have to bring Bath towels, beach towels and pool towels, and remember to bring plenty of towels to wipe down your dog after a bath from the beach. Additional Info: Indoor swimming pool, amusements, kid's club, and entertainment are optional through Manor Park. What a great caravan. So clean and comfortable. Had a short break with my partner, son and little pug. Antonia was very welcoming and we shall definitely be returning next year. Thanks Antonia for making our holiday comfortable and relaxing. See you next year. This really is the perfect place for a holiday. 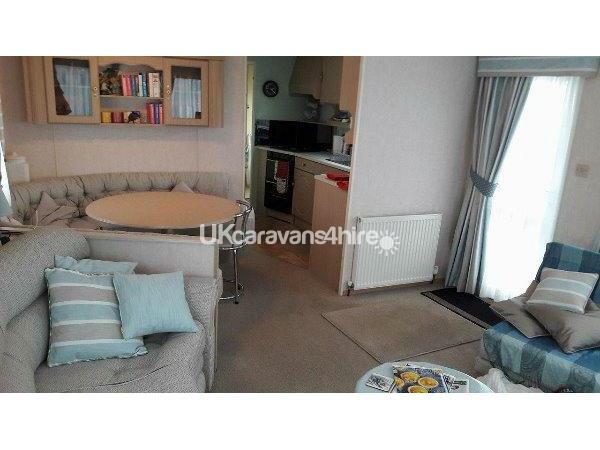 We have stayed in many caravans some in Manor Park but never in one as good as this. There is everything you need and the personal touches by Antonia make all the difference she is the perfect host. The beds are so comfortable with little extras to make your stay stress free without the usual list of things you can't do which often leaves you frightened to move.We have found our forever holiday home so no more searching for perfection as we have already found it...Thank you Antonia we will see you again very soon. Brian and family, what can I say other than THANK YOU for your review, I never ask for reviews, so when I get one, I know it is truly meant... and I appreciate your feedback. I know you had a wonderful holiday - home from home. I saw one of my two year returning guests today, and he stopped me in my Mini and said "Well, what do you think I'm doing here and not in your caravans." I couldn't answer that question, I just said "Well, you are not in B22 and your friends are not in K29, so where are you?." He pointed to the most beautiful Lodge on Kensington and told me he had purchased it a couple of months ago.... :) I am sorry to lose the occasional returning guest, but occasionally they do become owner friends. 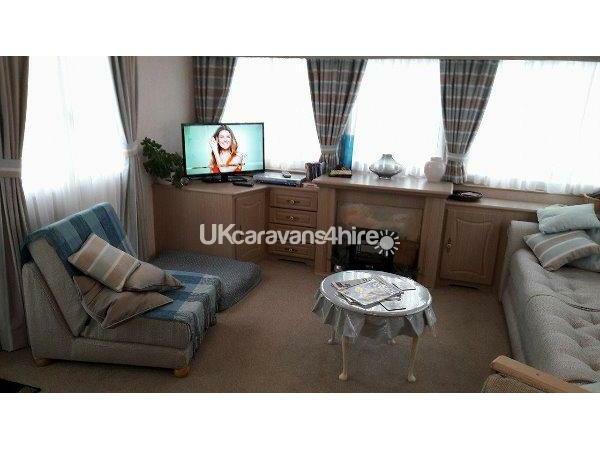 This is my 2nd stay in this wonderful home from home, well equipped lovely caravan. Antonia is so helpful and will do everything to make your stay as comfortable and homely as possible. My dog Oscar also loves this caravan and the setting is peaceful and serene and the ducks will visit if you're kind to them :) Thank you Antonia and see you sometime soon.